You had a lot more respect for the great artists of the past before you discovered their formulas. Now that you know that making a modern art masterpiece is as simple as rearranging the constituent parts, you can put your own gallery to work creating “new” works by the masters. But not so fast! Will the visitors to your gallery be able to tell what your pictures are once you’ve rearranged them? 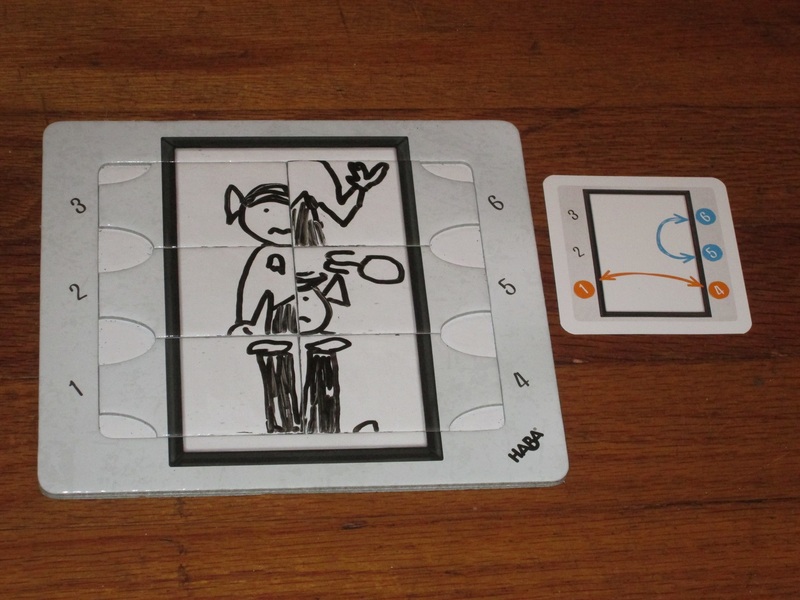 Picassimo is a drawing party/puzzle game for three to six players. Players are artists trying to recreate the stolen works of the great Paco Picassimo. The player with the most points wins. 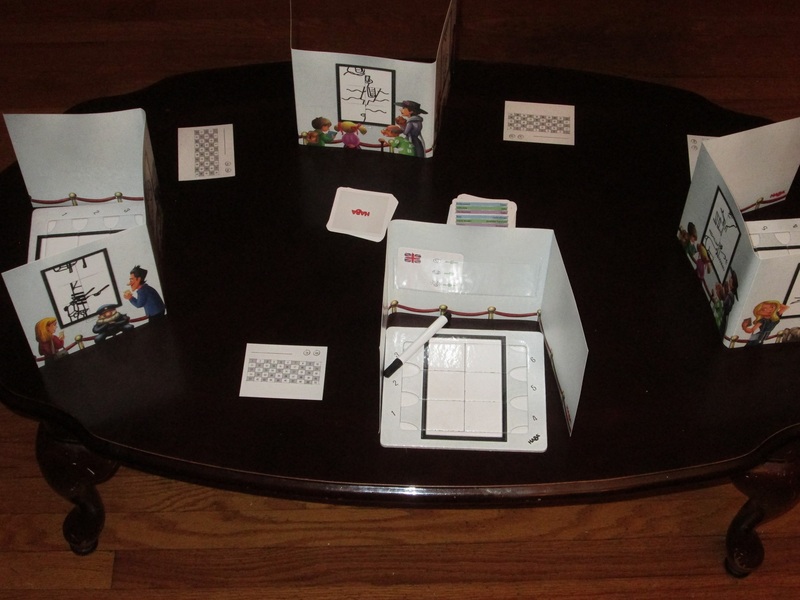 Picassimo set up for four players. 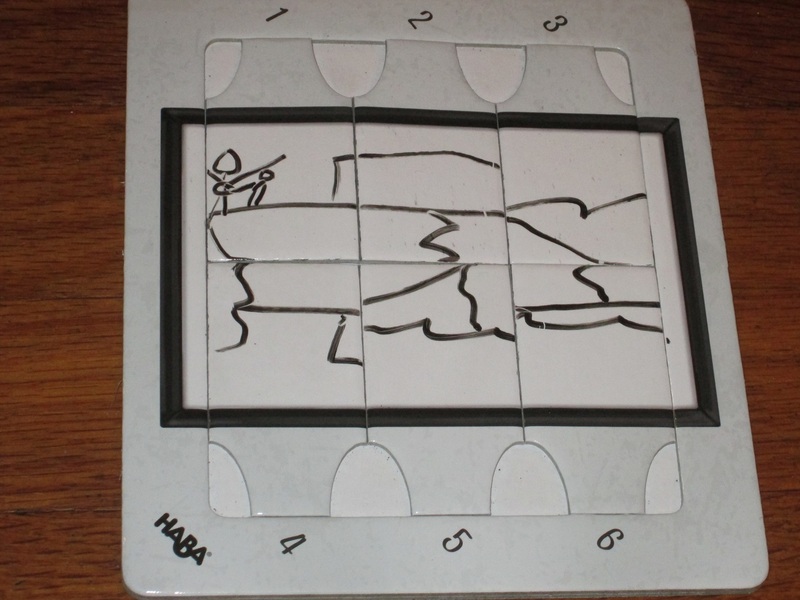 The drawing can be portrait or landscape, but the HABA logo can’t be upside down. The drawing must span all six panels of the drawing board. No letters, numbers, symbols, or arrows allowed. Once all players but one (or two in a six-player game) have finished, they count down “3-2-1” for the remaining player, who must finish at the end of the countdown. 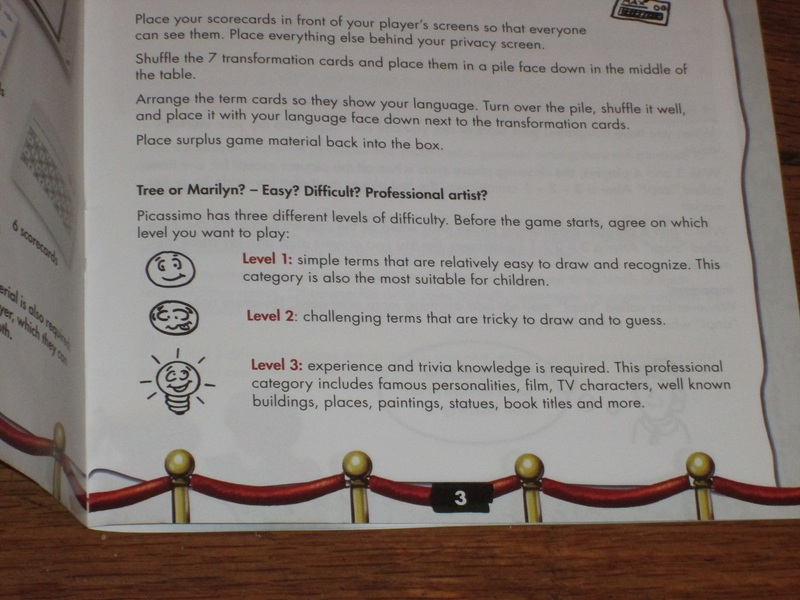 The transformation card is revealed, and players must switch the four panels indicated on the card while the drawing is still behind their screens. Beginning with the player who finished drawing first, players try to guess each player’s drawings. If a player guesses the drawing while it’s rearranged, that player and the artist score 3 points each. If players cannot guess the clue from the rearranged drawing, the artist puts it back to its normal state. If a player guesses it now, that player and the artist both score 1 point. Players keep score on dry erase score cards. You can even write your name on the top. 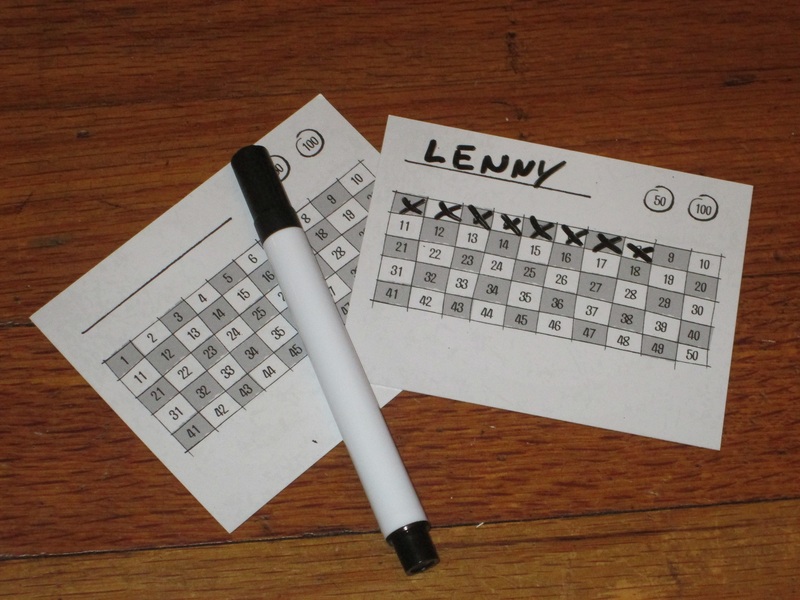 The game is finished after seven rounds (all transformation cards are used). The player with the most points wins. 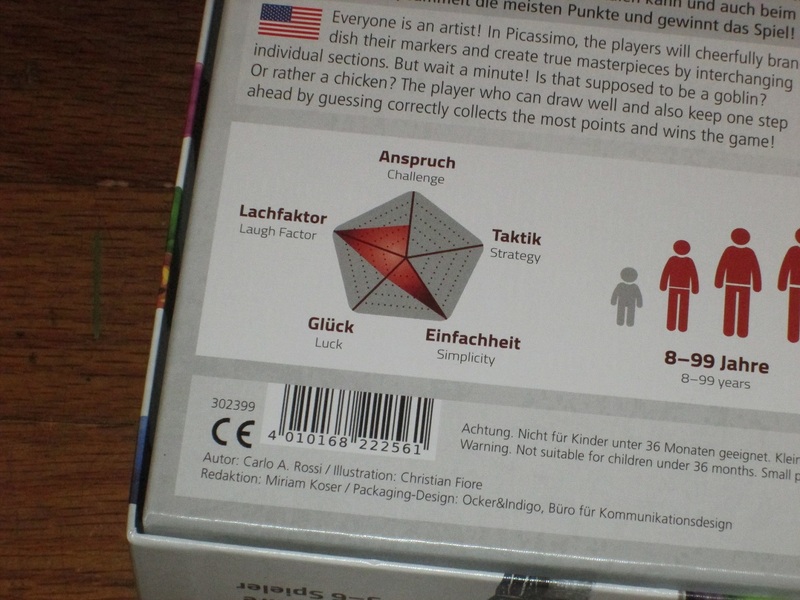 The Picassimo box indicates that the game has a high “Lachfaktor,” which is exactly what you’d hope for from a party game. Does Picassimo deliver on this promise? Well, yes and no. But more on that in a moment. The “Lachfaktor” in Picassimo is off the charts according to the box. It’s a little more determined by group and play style in practice. Drawing games are pretty standard in the party genre, for better or worse. We’ve already got the one-everyone-knows, Pictionary, and the high “Lachfaktor” Telestrations, so anything new has to have a unique hook. 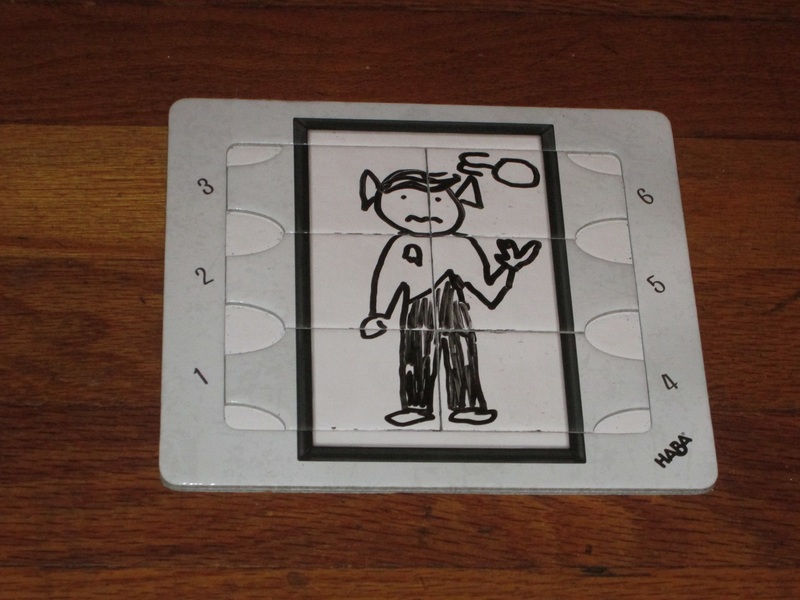 And Picassimo certainly has that: draw a picture, mix up the pieces, and let the others guess it. Not only is it playful nod to the works of Pablo Picasso, but it also serves as an interesting twist on a drawing game. It’s an interesting twist because the fun of drawing games is in that most people aren’t great at drawing, at least under the limitations presented to them. Here, the limitation is fairly easy: you simply have to use all six panels of your board. And if all players agree, you could even spend a while on the pictures you draw–only the slowest player might not finish. The twist is that players won’t get a straight perspective of what you’ve done. It’s a little harder to tell this is Mr. Spock when the pieces are all over the place. You might think, Won’t it still be easy to guess the picture, even if the panels are rearranged? In some instances, if the picture is competently drawn, yes. But not in as many as I thought. A simple object like a gondola can look quite foreign with just four panels switched. Heaven help you if you’ve been tasked to draw the Acropolis. Both the draw-er and the guesser get more points for guessing while the drawing is rearranged, but sometimes it’s necessary to restore the drawing to its original state, which usually produces good laughter as players finally see what they should have seen before. 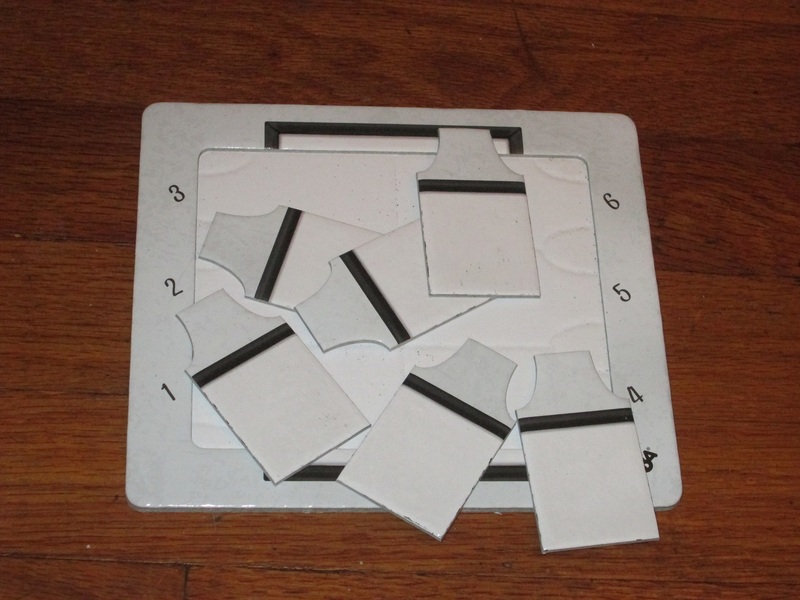 The dry erase boards in the game have removable pieces, so taking the drawing apart is a cinch. 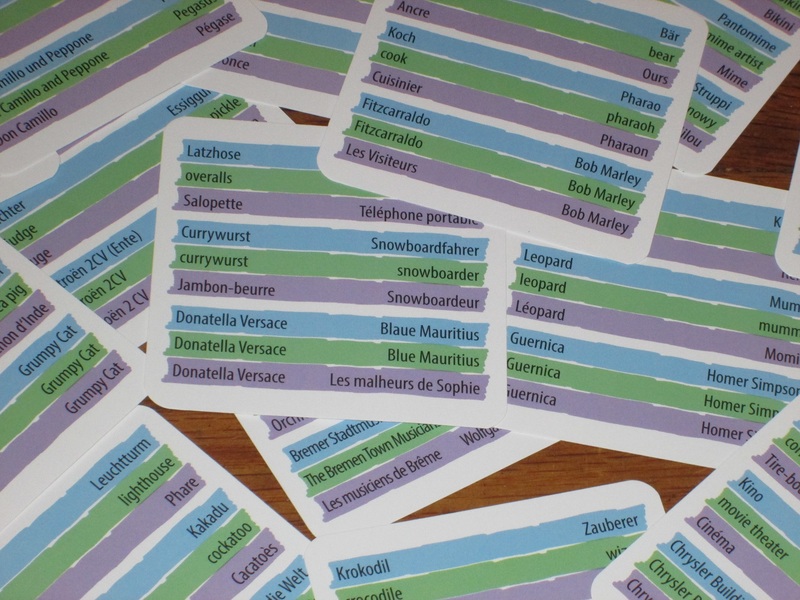 The clue cards in Picassimo are in six different languages, and each card has six possible clues on it sorted into three categories (whew!). While picking out the clues in your language can be difficult if you aren’t paying attention, the game comes with identifiers so you can easily tell which language is yours. It’s a boon that each category has two options, too, as it gives players some agency over what they draw. 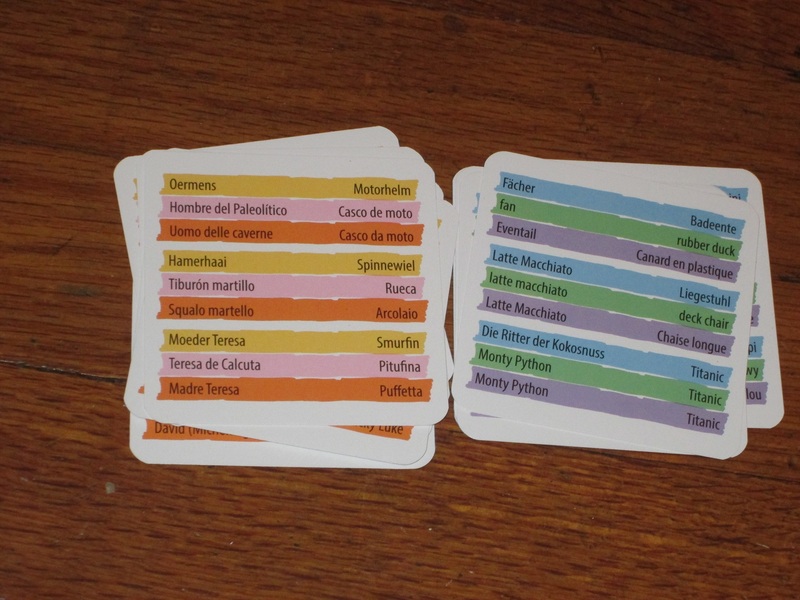 The clue cards in Picassimo are multilingual in six languages. For better or worse. The scoring system in Picassimo is fine, and if your group is the more competitive sort, you’ll want to keep score. But the game is fun even if you don’t. In fact, it might be more fun to just see what other people have drawn and guess at it. 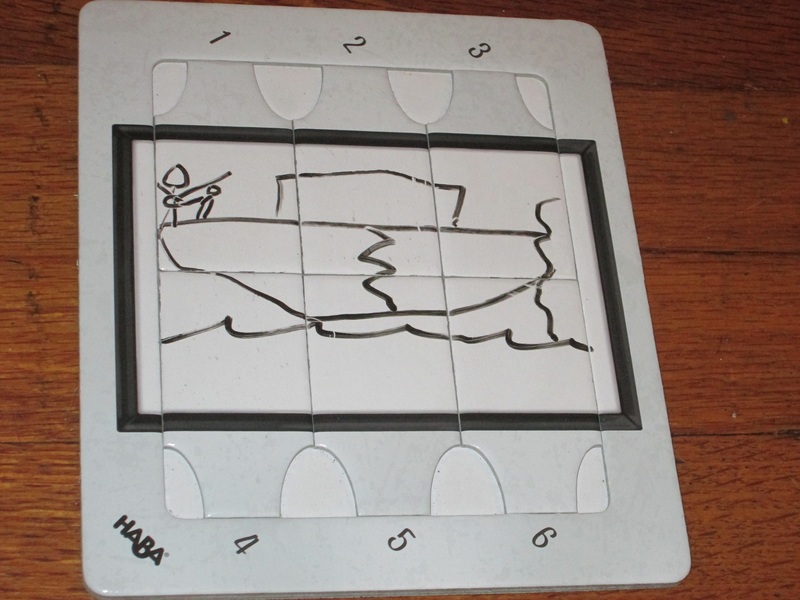 I used to play an app-based drawing game with my family, and when we played together, rather than trying to get the most points, we did whatever we thought would get the bigger laugh, often creating elaborate drawings for simple concepts. There’s probably not enough time or detail in Picassimo to create elaborate drawings here, but I think laughter here is similarly a better goal than winning. There are plenty of other games where scoring points is the main goal. But “Lachfaktor” is Picassimo’s strength, and it’s better to play to strengths. 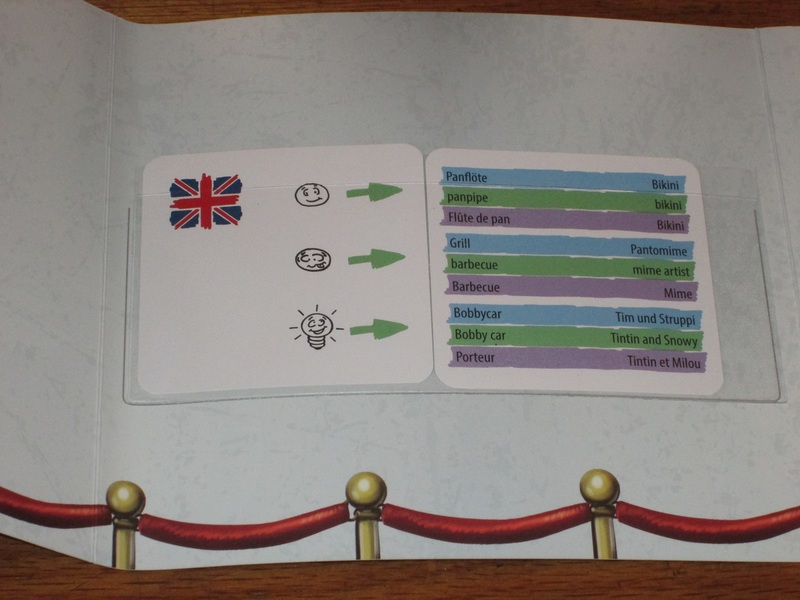 Thankfully, each board comes with a language card to help players easily identify the words they should be looking at. Even so, some of the difficult clues are difficult indeed. Similarly, the best way I’ve found to get mileage on the “Lachfaktor” scale is to push the difficulty as far as you can, and even a little farther. For most adults, this will mean skipping the simple and intermediate difficulty levels save as training rounds. You might receive some pushback when you suggest upping the difficulty–I did–but trust me: it’s worth it. While it’s still difficult sometimes to guess pictures on the intermediate (and even easy) level, it’s not funny. It doesn’t produce the kind of laughs that come from one player’s drawing eliciting guesses of “Harry Potter!” on the one hand and “Betsy Ross!” on the other. You might get guesses of “earthworm” and “roller coaster” on intermediate difficulty, which is amusing, but not the kind of laughter you hope for from a party game like this one. And Picassimo (like most party games) is at its best when the laughter flows freely. The difficult words are all proper nouns, so they are probably too hard to play with children–and can even be difficult with adults–but the rules offer the optional suggestion of giving a category before showing the difficult drawing, which might be the right choice in some groups. 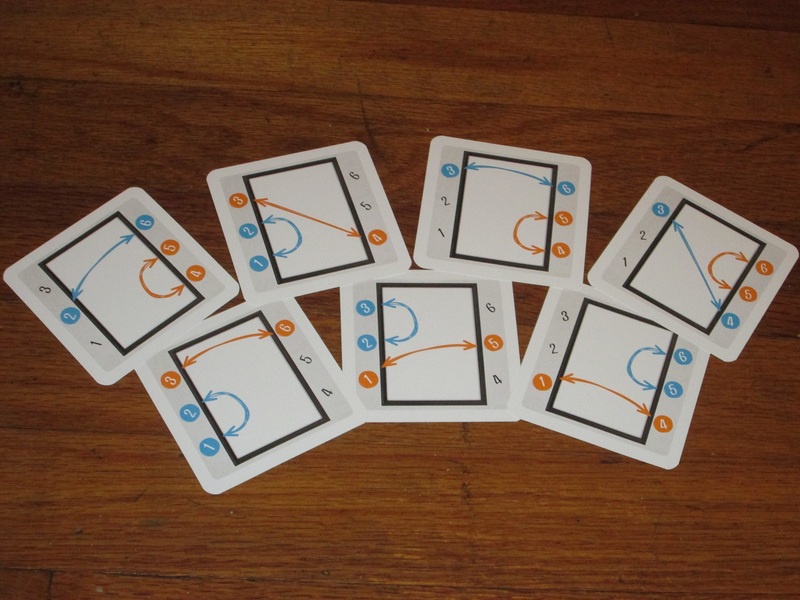 Seven transformation cards guide players as they rearrange their boards before guessing. There’s always one change that flips tiles around and one change that merely changes the order. Any guesses what this picture is? Also, by including clues in six different languages, HABA has made the game multilingual, but also variable in terms of propriety. For example, one intermediate clue was “wingsuiting.” This is something I can imagine, but it’s not something that’s popular or even widely known where I’m from. Similarly, some of the difficult clues are localized to certain regions around the world and are difficult indeed. (In some cases, the words are different between regions, but not in all.) I’m sure it’s no easy task to find a cultural icon that is known in six different regions, and so several of the difficult clues that came up in my group were fine art pieces, which some of us were unfamiliar with. It’s a mercy that each category offers a choice between two clues, but we instituted a further house rule that players can exchange cards if the clues are too difficult. (I trust my group not to abuse this.) With younger players, I imagine you’ll need to stick to the intermediate or even the easy words. It’s the Titanic, silly! … No, really. It’s the Titanic. You can’t tell that’s an iceberg?! Picassimo advertises play for three to six players, and I’ve played with groups at both poles. Both ways are enjoyable. I should stress how fun the game was even with three, because that’s usually not the case with a “Lachfaktor” game. With fewer players, though, Picassimo moves even faster, and it doesn’t suffer much from having fewer people to guess. (And especially if you’re keeping score, there’s less angst at being just a fraction of a second too slow to score the points.) I enjoy the game with more players too. It’s also worth mentioning that if no one is able to guess the drawing mixed up, it can be awkward for someone to finally decide that the drawing needs to be rearranged. My groups have started either counting in our heads or using a short timer. My experience with this game is with adults (my kids are still a little too young for this), but so far, it has gone over decently well with both family and coworkers, although some of my coworkers were happy to move on to other things when it was over. Picassimo takes something that we’ve seen before–a simple drawing/guessing game–and adds just enough of a twist to change the game and keep it interesting. While I don’t think this will be a hit if your group is primarily strategy gamers (the game is best when you don’t care about points), the family crowd and social gamers will get a kick out of rearranging and guessing your portraits. While I’m not sure the “Lachfaktor” is maxed out in every gaming situation, you can easily tailor the options in the game to your group so as to get the most laughs possible. Picassimo delivers a fun premise in an engaging package, which is something a lot of people will be able to get behind. 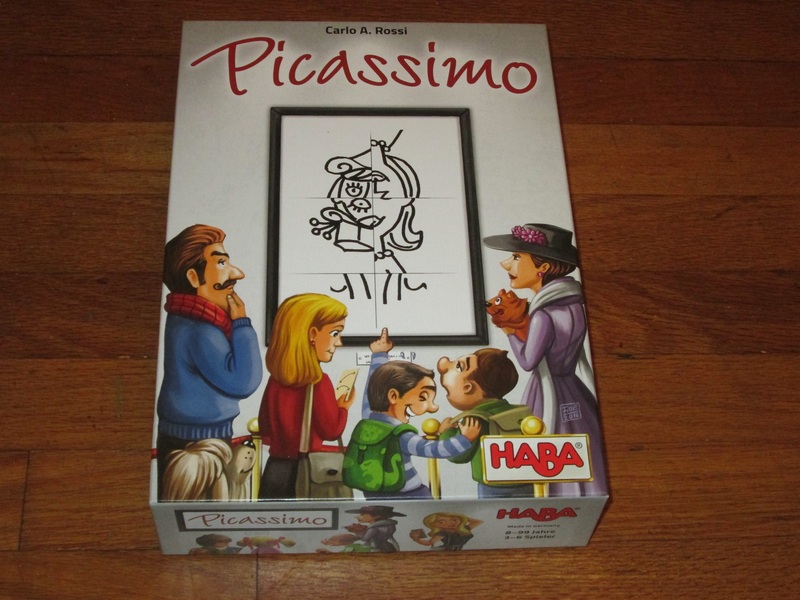 iSlaytheDragon would like to thank HABA USA for providing us with a copy of Picassimo for review.